Last Sunday, we left Elkanah, our Israeli madricha, Adi’s, hometown, after spending Shabbat there. 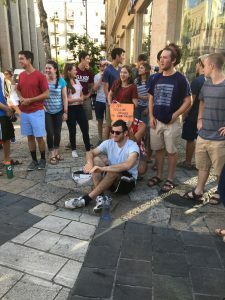 Unfortunately, following our departure, Dan, Mason, Nate, and Noa started an epidemic of fever, stomach pain, and a lot a lot a lot of shilshul that spread as fast as last summer’s sickness. Since this week’s theme is IDF, later that day we spoke with the parents of fallen lone soldier Alex Singer, who left behind meaningful letters about his army experience. We also met with a female combat soldier who told us about her unique experience of working with dogs in the army. 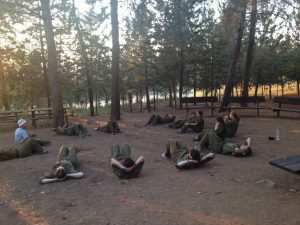 On Monday, the boys and girls were split up to learn essential army skills such as teamwork, fire building, and night navigation, including a scavenger hunt around the neighborhood. With our numbers greatly dwindled due to the sickness, on Tuesday, some of us headed out to the more intense army day. We did team building activities, survival skills, and learned to walk as an army (including holding a stretcher while walking). We enjoyed some gourmet canned corn and olives for dinner which fueled us to sneak around in the woods later in the evening. After getting minimal rest, we wrapped up army day by walking up a mountain with a stretcher on our shoulders. We then made our way to Ramat Rachel for some much neede d rest and relaxation. On Thursday, we had the opportunity to design a shirt for charity through the Nu campaign and then spoke to campers from Kids For Peace who told us about their amazing interfaith organization. For dinner, we headed to Ben Yehuda Street where we sang Zim songs to raise money for lone soldiers and were joined by Elie Lerea. Today, we had an emotional tour of Har Herzl where we were told some personal stories by our Israeli tour guide, Yitzhak. This afternoon, we headed to the Old City to visit the Church of the Holy Sepulcher. We are currently preparing for our penultimate Shabbat in Israel where we will do Kabbalat Shabbat at the Kotel.